Oxidation behavior of materials with High-Pressure Differential Scanning Calorimetery. DSC measures the enthalpies associated with transitions and reactions and the temperature at which these processes occur. The method is used for the identification and characterization of materials. 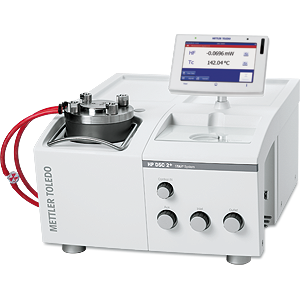 High pressure differential scanning calorimetry allows you to measure samples under precisely defined atmospheres at pressures of up to 10 MPa as a function of temperature or time. Higher pressures and temperatures accelerate chemical reactions and shorten analysis times. Increased pressure suppresses vaporization and shifts the effect to higher temperatures. The high-pressure DSC is an excellent instrument for studying the influence of pressure and atmosphere on a sample or for separating an effect that is overlapped by vaporization. Increased pressure is a factor that influences all physical changes and chemical reactions in which a change in volume occurs. For material testing, process development or quality control there is often no alternative to DSC measurements under pressure. Measurements performed under pressure expand the scope of thermal analysis. 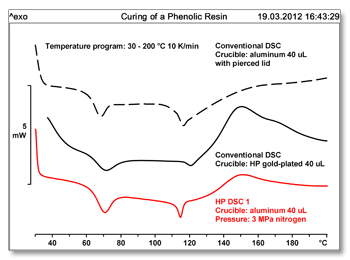 In the HP DSC 2 +, the low-inertia, fast heating/cooling DSC furnace is incorporated in a water-cooled pressure vessel. The furnace is specially insulated so that no temperature gradients occur. This guarantees a stable and reproducible baseline, even at higher pressures. A double safety system limits the pressure to the permissible range (bursting disk and construction of the sealing system). There are three gas connections each with a control valve for: - rapid filling (pressure build-up) - purging the furnace chamber during the measurement (flow control) - the gas outlet (pressure control). The high-pressure DSC cell is based on the successful Thermal Analysis Excellence DSC technology and guarantees outstanding performance thanks to its FRS 6 + and HSS 9 + DSC sensors. The HP DSC 2 + operates at overpressures from 0 to 10 MPa and from room temperature up to 700 °C. A pressure gauge displays the actual pressure in the cell. An external pressure and flow controller is available as an option. This allows accurate pressure control in static and dynamically programmed atmospheres. Increased pressure influences all physical changes and chemical reactions in which a change in volume occurs. For material testing, process development or quality control there is often no alternative to DSC measurements under pressure. High pressure differential scanning calorimetry allows you to measure samples under precisely defined atmospheres at pressures of up to 10 MPa as a function of temperature or time. 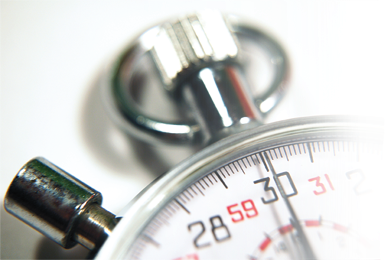 Higher pressures and temperatures accelerate chemical reactions and shorten analysis times. Increased pressure is a factor that influences all physical changes and chemical reactions in which a change in volume occurs. For material testing, process development or quality control there is often no alternative to DSC measurements under pressure. Increased pressure suppresses vaporization and shifts the effect to higher temperatures. The high pressure differential scanning calorimetry (HPDSC) is an excellent instrument for studying the influence of pressure and atmosphere on a sample or for separating an effect that is overlapped by vaporization.